Sweden’s Matilda Söderlund went on a tear in Spain where she onsighted a handful of hard 5.13’s in a relatively short time span. Rock & Ice caught up with her to learn more. Subsequent to this she also flashed Kale Borrroka (5.14a) in Siurana according to her 8a scorecard. In addition to her repeat of Era Vella (5.14d), over the past few weeks Sasha DiGiulian has done the 2nd ascent of Atonement (5.14a) at the Virgin River Gorge and flashed Zona Zero (5.13d) in Siurana. Andy Raether did the FA of Ancient Chinese Secret (5.14b) at Mt. Potosi, NV commenting on his 8a scorecard that it took him 6 months of work. James Pearson and Caroline Ciavaldini teamed up to do the first repeat of Aria, a runout 10 pitch 5.13c on the island of Sardinia. Nice update from Dave MacLeod on his repeat of New Base Line (V14) in Magic Wood, Switzerland. Rob Pizem has done the FA of The Frank Zappa Appreciation Society which, at 5.13+, is likely the hardest route in Colorado’s Escalante Canyon. Silvia Vidal spends 32 consecutive days on the wall to establish a new route in Chile. God’s Own Stone (5.14a) in the Red River Gorge saw two more ascents this spring from the under-18 crowd when it was repeated by both 12-year-old Drew Ruana and 11-year-old Mirko Caballero. 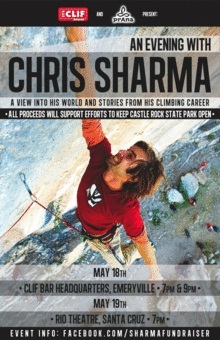 Chris Sharma will be appearing at an event in Emeryville, CA on May 18th for a special fundraiser benefiting access threatened Castle Rock State Park. More details on the event as well as how to buy tickets here. Interview with South African Arjan de Kock who recently did the 3rd ascent of The Big Island (V15) in Fontainebleau. Interesting discussion at B3Bouldering about women and the development of new climbing areas. Speaking of looking legit, Jonathan Siegrist provides an update on his time spent in France’s Verdon Gorge.